Amazon.com description: Product Description: "In this splendid volume, editors Gregory A. Waselkov and Kathryn E. Holland Braund pull together from a variety of published and archival sources Bartram's observations on Southeastern Indians, particularly the Creeks, Seminoles, and Cherokees. . . . With this comprehensive compendium, the scope of Bartram's contributions to the fields of ethnohistory, anthropology, and historical archaeology can finally be understood. "-Mississippi Quarterly "An exemplary work. . . . Waselkov and Braund have given scholars and fans of Bartram an invaluable source of his writing on the southeastern Indians and the tools and information with which to interpret and use his work. 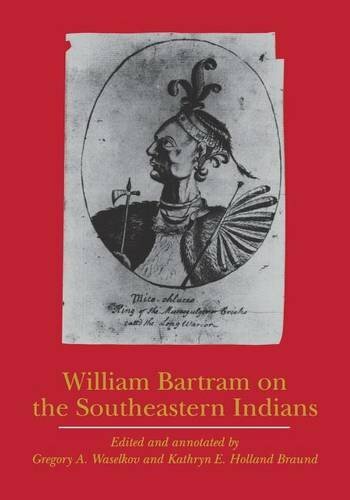 "-American Indian Culture and Research Journal William Bartram on the Southeastern Indians is essential reading for anyone interested in the Native American Southeast. . . . As a primary source, the book is an invaluable collection of information; as a scholarly work, it is unparalleled in its informed presentation and critical review of Bartram's writings. "-North Carolina Historical Review Gregory A. Waselkov is a professor of anthropology and director of the Center for Archaeological Studies at the University of South Alabama. He is the author of Old Mobile Archaeology and the coeditor (with Bonnie L. Gums) of Plantation Archaeology at RiviÃ¨re aux Chiens, Ca. 1725-1848. Kathryn E. Holland Braund is an associate professor of history at Auburn University and the author of Deerskins and Duffels: The Creek Indian Trade with Anglo-America, 1685-1815 (Nebraska 1993). About: William Bartram traveled throughout the American Southeast from 1773-1776. About: "In this splendid volume, editors Gregory A.